February 14th, 2005. 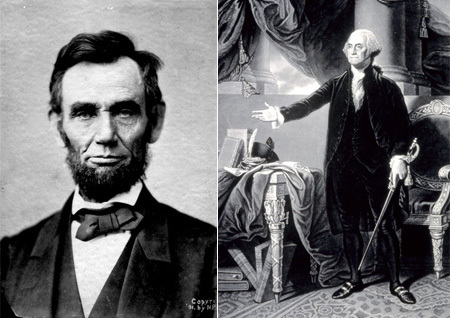 Just one week until my favorite holiday, President’s Day. I was busy growing my Abraham Lincoln beard and powdering my George Washington wig when the phone rang. Startled, I dropped my wig on the floor. Powder everywhere. I picked up the phone. It was my friend Jeff. “How are you going to keep it from her for a whole week that Monday’s President’s day?” I asked. Jeff seemed confused by my question, but I just took that to mean that he was drunk. I arrived at the party on the 21st in full presidential costume, stove pipe top hat and all, only to look around in shock to see that none of the other guests had decided to dress up. 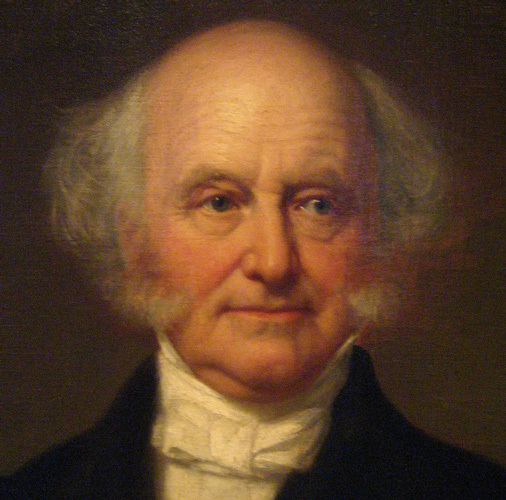 One guy kind of looked like Martin Van Buren but I think that was just due to the fact that he was short because when I complimented him on his costume and pointed out how short he was, he seemed confused and angry. Just then, we heard Rebecca’s car pull up into the driveway. “That’s super unpresidential,” I pointed out as everyone ducked behind the couch. The party was pretty lame. There were decorations up all over that read ‘happy birthday’ but no one wanted to talk about the presidents. Presidents day has become so secularized, I thought. I decided to give Rebecca her present. “You’re so sweet,” she said, unwrapping it. It was a cake. 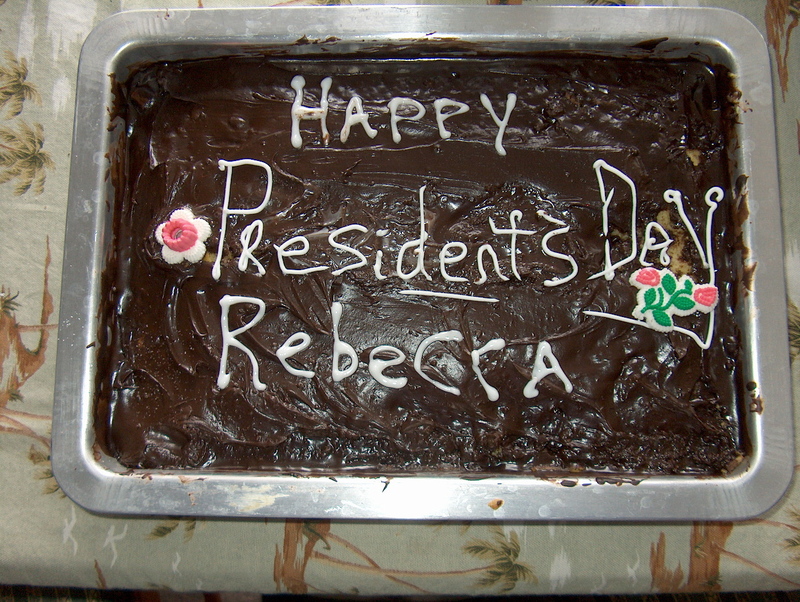 “Happy President’s Day Rebecca” it read. “What did you just say?” She asked me. How could I best explain myself? The only way I know how. With another cake. I immediately left the party and returned home. After several hours, I returned with another cake. 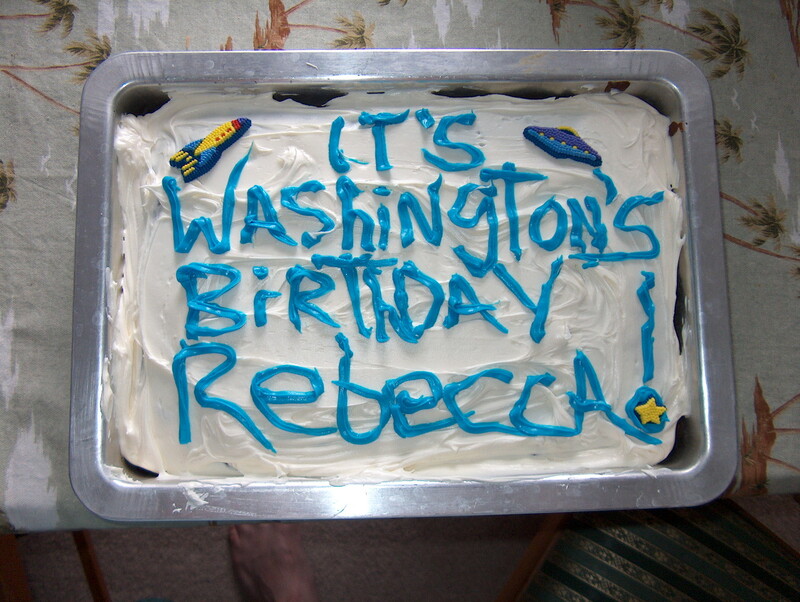 “It’s Washington’s Birthday Rebecca!” it read. By this time, most, if not all of hte party had left. “Um, thanks.” Rebecca seemed confused and annoyed. I went home with an unsettled feeling. For weeks I wait for a response from Rebecca, but heard nothing. I decided to confront Rebecca head-on about the issue. I thought cake would be the best format. I haven’t heard from Rebecca since that fateful Presidents day so long ago. Rumor has it that she was killed by a former president, but again, that could just be a rumor. Tim, I love your sense of humor, because it’s my sense of humor, and by that I mean this is a subpoena for your arrest for plagiarism and intellectual property theft. That said, I really enjoyed this post and hope to see you soon in your courtroom best. And as you’ve been served, would you mind serving me a piece of cake? Or pie, but not humble. I’m allergic. Cake is a very slow form of communication, despite being one of the routes to a man’s heart. I learned this the hard way. 90 percent of my communication was via cake. It was very expensive too. Thank you! Yeah, come on Rebecca! As a Rebecca, I am giggling.